Since I last wrote in this space, September wound up, October came and went, and November is now upon us. Up on New Horizons, we've completed another long series of important milestones as we prepare our spacecraft and instrument payload for the long journey ahead. New Horizons is now beyond 4 astronomical units (au) from the Sun. That puts us three-quarters of the way to Jupiter, which we'll pass on Feb. 28, 2007. Loading and enabling the Guidance and Control flight software build 4 (G & C 4.0), our cruise load, which I wrote about in my previous two columns. Completing initial calibrations and taking the first cruise science plasma data with our particles and fields instruments, PEPSSI and SWAP. Calibrating Venetia, our student-built dust counter, to filter out noises on the spacecraft that mimic the dust particle impacts we're trying to study. Loading and activating Autonomy Flight Software build 14, containing a series of enhancements and bug fixes to our onboard fault detection and correction software. In addition to these activities, the spacecraft team at APL and our navigation team at KinetX, Inc., in southern California, have carefully compiled all available tracking data to show that our actual course is very close to the optimal trajectory to the Pluto aim point at Jupiter. At a meeting on Oct. 19, we concluded that we're so close to the optimal course that no corrections appear to be necessary on the way to Jupiter. Actually, we got a formal solution telling us we should make a mid-December course correction of about 0.4 meters/second (0.9 miles/hour), but the effort to design and test this engine burn wasn't worth the time it would take away from more important activities, like planning the best possible Jupiter encounter. Moreover, the error induced by skipping this maneuver will be small — only about 870 kilometers (550 miles) at Jupiter. 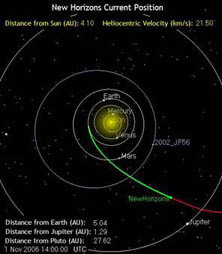 That may sound like a lot, but when you compare that to the Pluto aim point's 2.48 million-kilometers distance from Jupiter, you see that we're on a bulls-eye course with a predicted error of 0.035% (that's 3.5 parts in ten thousand, folks, equivalent to throwing a football two miles and still putting it within easy reach of the receiver). So we'll accept this tiny aim-point error up for now, and then make it up in our planned post Jupiter trajectory flyby clean up engine burn next spring. Back on Earth, we've been putting increasing amounts of effort into planning the long list of command sequences needed to take of the many calibration and science observations associated with our Jupiter flyby. Keep in mind that our mission team is very small — literally less than a couple of dozen operations people to plan and test all of this activity and control the spacecraft. Every activity we plan — each imaging session, each spectroscopic observation, each plasma instrument activity, et cetera, et cetera requires us to design, code, and then test a unique command sequence two ways: via a software simulation and a run on the spacecraft simulator, followed by test results reviews and then uplinking to our bird out there past 4 au. With more than 165 observations on the Jupiter encounter wish list and a record-setting fast trajectory to Jupiter, we recently found ourselves on too tight of a schedule to get everything planned, built, tested, and ready for uplink to New Horizons. So last week, as mission PI, I opted for us to go light on distant observations beginning in January and early February. This meant cutting out almost 2/3 of the originally hoped for observations in January. Most of these involved the two instruments I am responsible for, Alice and Ralph. Although we're still left with more than 20 science activities in January (a record compared to anything we did during instrument commissioning), including plasma monitoring on approach, imaging of Jupiter, and some distant calibration activities, there was pain in this, because I had to sacrifice a bevy of Io torus and Jovian auroral observations on approach. The reward for this sacrifice on distant approach, however, comes at Jupiter. There, in an intensive 10-day period around our Feb. 28 closest approach, we now have a fighting chance of designing, testing and carrying out virtually all of the approximately 100 observation sequences planned to occur when we're in the heart of the Jupiter system. It's no fun to cut anything out, but we're a small team on a tight budget and the time until we reach Jupiter is rapidly running out. In fact, observations will begin just two months from now — on Jan. 1, 2007! 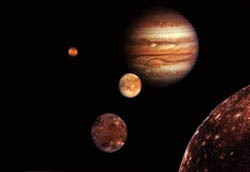 Jupiter (upper right), its magnetosphere, and its four large moons, are all targets for study by New Horizons during the upcoming early-2007 flyby. Until then, we're planning a quiet couple of months on the spacecraft so we can focus on Jupiter activity planning and testing. Other than routine spacecraft housekeeping, we only plan a handful of cruise science measurements with SWAP and PEPSSI, a couple more Ralph, LORRI, and REX commissioning activities, and a test of our dual transmitter communications that we hope will allow us to double our downlink rates from Jupiter. It's getting late in the day and I still have a New Horizons talk to prepare for the Texas Space Grant Consortium. But before I go, I have two more things to tell you about. The first is a recap of some of the exciting new Pluto-system science results presented at this year's Division of Planetary Science (DPS) meeting, which took place in Pasadena, California, in mid-October. The second is about the New Horizons communications blackout period in late November. The spectroscopic discovery of ethane (C2H6) on Pluto's surface, presented by Dale Cruikshank of NASA/Ames Research Center (a New Horizons co-investigator) and colleagues. This ethane is produced from the photolysis or radiolysis (i.e., the chemical conversion driven by sunlight and charged particles) of frozen methane (CH4) on Pluto's surface and suspended in its atmosphere. Ethane on Pluto has long been predicted, but no one had actually detected it before. A series of talks by various workers from MIT, SwRI, Lowell Observatory, and Williams College in the U.S., and from France, reporting the results of the June 12 occultation of a star by Pluto, giving us a new opportunity to probe Pluto's atmosphere. Among the findings that have emerged from that event were that Pluto's atmosphere remains at the higher pressure levels seen in 2002, with no sign of cooling or collapse just yet. However, an increasing amount of turbulence is being seen in Pluto's atmosphere. What that means isn't clear. A series of future stellar occultations will occur over the next five years, giving us a quasi-continuous capability to track Pluto's atmospheric evolution during most of the flight of New Horizons. This will help keep us from being overly surprised about its atmospheric state when we arrive. An observation by Jason Cook (ASU) confirming that ammonia hydrates lie on Charon's surface. This exotic mixture was tentatively identified on Charon by Will Grundy of Lowell Observatory (another New Horizons co-investigator) in 2002 and 2003. Its discovery indicates Charon isn't just a dead water ball the diameter of Texas, but has a more interesting story to tell, possibly including recent cryovolcanism on its surface. We'll be on the lookout for that with LORRI, Ralph and Alice when New Horizons arrives. Tight constraints on any extant rings at Pluto, reported both by Jay Pasachoff (Williams College) and Andrew Steffl (SwRI). The first ground-based detections of Pluto's small satellites, Nix and Hydra, reported by Cesar Fuentes (Harvard) and also Christophe Dumas (JPL). Now that Nix and Hydra can be studied from the ground—in addition to from Hubble—I expect our knowledge of them to increase even faster. Well, that wraps up the new science results I wanted to highlight for you. I'll close now with a little more on the communications blackout that will occur later this month. 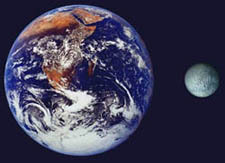 Earth and Pluto, to scale. The reason for the upcoming blackout is that we have a solar conjunction coming up in late November. More specifically, from November 19 to 27, New Horizons will be almost exactly on the opposite side of the Sun from Earth, with the spacecraft's position in Earth's sky less than 3 degrees from the position of the Sun, making communications difficult. This happens to most planetary spacecraft each year, and some of you will recall that the Mars rovers and orbiters all experienced a solar conjunction blackout in October. As a result of the Sun's interference, we won't plan to communicate with New Horizons at all during those eight days, but we will monitor its carrier signal to see how close to the Sun we can operate in future solar conjunctions. We think we can successfully communicate more like 2 degrees off the Sun, rather than the 3 degrees we're sure of. If this proves out to be true, then each subsequent annual conjunction/communications blackout the rest of the way to Pluto and across the Kuiper Belt will be dramatically shorter than this one. I'll let you know how we did on that test in my next update, sometime in the first part of December. In the meantime, keep on exploring!